The Count of Monte Cristo was originally published in the Journal des Débats in eighteen parts. Serialization ran from August 28, 1844 to January 15, 1846. The first edition in book form was published in Paris by Pétion in 18 volumes with the first two issued in 1844 and the remaining sixteen in 1845. Most of the Belgian pirated editions, the first Paris edition and many others up to the Lécrivain et Toubon illustrated edition of 1860 feature a misspelling of the title with "Christo" used instead of "Cristo". The first edition to feature the correct spelling was the L'Écho des Feuilletons illustrated edition, Paris 1846. This edition featured plates by Paul Gavarni and Tony Johannot and was said to be "revised" and "corrected", although only the chapter structure appears to have been altered with an additional chapter entitled La Maison des Allées de Meilhan having been created by splitting Le Départ into two. The first appearance of The Count of Monte Cristo in English was the first part of a serialization by W. Francis Ainsworth in volume VII of Ainsworth's Magazine published in 1845, although this was an abridged summary of the first part of the novel only and was entitled The Prisoner of If. Ainsworth translated the remaining chapters of the novel, again in abridged form, and issued these in volumes VIII and IX of the magazine in 1845 and 1846 respectively. Another abridged serialisation appeared in The London Journal between 1846 and 1847. The first single volume translation in English was an abridged edition with woodcuts published by Geo Pierce in January 1846 entitled The Prisoner of If or The Revenge of Monte Christo. In April 1846, volume three of the Parlour Novelist, Belfast, Ireland: Simms and M'Intyre, London: W S Orr and Company, featured the first part of an unabridged translation of the novel by Emma Hardy. The remaining two parts would be issued as the Count of Monte Christo volumes I and II in volumes 8 and 9 of the Parlour Novelist respectively. The most common English translation is an anonymous one originally published in 1846 by Chapman and Hall. This was originally released in ten weekly installments from March 1846 with six pages of letterpress and two illustrations by M Valentin. The translation was released in book form with all twenty illustrations in two volumes in May 1846, a month after the release of the first part of the above-mentioned translation by Emma Hardy. The translation follows the revised French edition of 1846, with the correct spelling of "Cristo" and the extra chapter The House on the Allées de Meilhan. Most English editions of the novel follow the anonymous translation. In 1889 two of the major American publishers Little Brown and T.Y Crowell updated the translation, correcting mistakes and revising the text to reflect the original serialised version. This resulted in the removal of the chapter The House on the Allées de Meilhan, with the text restored to the end of the chapter called The Departure. In 1955 Collins published an updated version of the anonymous translation which cut several passages including a whole chapter entitled The Past and renamed others. This abridgement was republished by many Collins imprints and other publishers including the Modern Library, Vintage, the 1998 Oxford World's Classics edition (later editions restored the text) and the 2009 Everyman's Library edition. In 1996 Penguin Classics published a new translation by Robin Buss. Buss's translation updated the language, making the text more accessible to modern readers, and restored content that was modified in the 1846 translation because of Victorian English social restrictions (for example, references to Eugénie's lesbian traits and behavior) to reflect Dumas' original version. In addition to the above there have also been many abridged translations such as an 1892 edition published by F.M Lupton, translated by Henry L. Williams (this translation was also released by M.J Ivers in 1892 with Williams using the pseudonym of Professor William Thiese). A more recent abridgement is the translation by Lowell Bair for Bantam Classics in 1956. Many abridged translations omit the Count's enthusiasm for hashish. When serving a hashish jam to the young Frenchman Franz d'Epinay, the Count (calling himself Sinbad the Sailor), calls it, "nothing less than the ambrosia which Hebe served at the table of Jupiter." When he arrives in Paris, the Count brandishes an emerald box in which he carries small green pills compounded of hashish and opium which he uses for sleeplessness. (Source: Chapters 31, 32, 38, 40, 53 & 77 in the 117-chapter unabridged Pocket Books edition.) Dumas was a member of the Club des Hashischins. In June 2017, Manga Classics, an imprint of UDON Entertainment, published The Count of Monte Cristo as a faithfully adapted Manga edition of the classic novel. The first Japanese translation by Kuroiwa Shūroku was entitled "Shigai Shiden Gankutsu-ou" (史外史伝巌窟王, "a historical story from outside history, the King of the Cavern"), and serialized from 1901–1902 in the Yorozu Chouhou newspaper, and released in book form in four volumes by publisher Aoki Suusandou in 1905. Though later translations use the title "Monte Cristo-haku" (モンテ・クリスト伯, the Count of Monte Cristo), the "Gankutsu-ou" title remains highly associated with the novel and is often used as an alternative. As of March 2016, all movie adaptations of the novel brought to Japan used the title "Gankutsu-ou", with the exception of the 2002 film, which has it as a subtitle (with the title itself simply being "Monte Cristo"). The novel is popular in Japan, and has spawned numerous adaptations, the most notable of which are the novels Meiji Gankutsu-ou by Taijirou Murasame and Shin Gankutsu-ou by Kaitarō Hasegawa. Its influence can also be seen in how one of the first prominent cases of miscarriage of justice in Japan, in which an innocent man was charged with murder and imprisoned for half a century, is known in Japanese as the "Yoshida Gankutsu-ou incident" (吉田岩窟王事件). George Saintsbury stated: "Monte Cristo is said to have been at its first appearance, and for some time subsequently, the most popular book in Europe. Perhaps no novel within a given number of years had so many readers and penetrated into so many different countries." This popularity has extended into modern times as well. The book was "translated into virtually all modern languages and has never been out of print in most of them. There have been at least twenty-nine motion pictures based on it ... as well as several television series, and many movies [have] worked the name 'Monte Cristo' into their titles." The title Monte Cristo lives on in a "famous gold mine, a line of luxury Cuban cigars, a sandwich, and any number of bars and casinos—it even lurks in the name of the street-corner hustle three-card monte." Modern Russian writer and philologist Vadim Nikolayev determined The Count of Monte-Cristo as a megapolyphonic novel. The novel has been the inspiration for many other works, from Lew Wallace's Ben-Hur (1880), a science fiction retelling in Alfred Bester's The Stars My Destination, to Stephen Fry's contemporary The Stars' Tennis Balls. The success of Monte Cristo coincides with France's Second Empire. In the book, Dumas tells of the 1815 return of Napoleon I, and alludes to contemporary events when the governor at the Château d'If is promoted to a position at the castle of Ham. [Notes 1] The attitude of Dumas towards "bonapartisme" was conflicted. His father, Thomas-Alexandre Dumas,[Notes 2] a Haitian of mixed descent, became a successful general during the French Revolution. New racial-discrimination laws were applied in 1802. The general was consequently dismissed from the army and became profoundly bitter toward Napoleon. In 1840, the ashes of Napoleon I were brought to France and became an object of veneration in the church of Les Invalides, renewing popular patriotic support for the Bonaparte family. In "Causeries" (1860), Dumas published a short paper, "État civil du Comte de Monte-Cristo", on the genesis of the Count of Monte-Cristo. [Notes 3] It appears that Dumas had close contacts with members of the Bonaparte family while living in Florence in 1841. In a small boat, he sailed around the island of Monte-Cristo, accompanied by a young prince, a cousin to Louis Bonaparte, who was to become Emperor of the French ten years later. During this trip, he promised the prince that he would write a novel with the island's name in the title. At that time, the future emperor was imprisoned at the citadel of Ham – a name that is mentioned in the novel. Dumas did visit him there, although he does not mention it in "Etat civil". 1795–97: He becomes famous and fights under Napoleon. 1836: Alexandre Dumas is famous as a writer by this time (age 34). 1841–44: The story is conceived and written. 1844–46: The story is published in parts in a Parisian magazine. 1846: The novel is published in full and becomes a European bestseller. 1958: Vanjikottai Valiban (வஞ்சிக்கோட்டை வாலிபன்), Tamil film adaptation and its Hindi remake Raaj Tilak. 1977: The Great Vendetta [zh] (大報復), Hong Kong television serial starring Adam Cheng, in which the background of the story is changed to Southern China during the Republican Era. 1979: Nihon Gankutsuou [ja] (日本巌窟王), Japanese television serial set in Edo period, starring Masao Kusakari. 1979: Le Comte de Monte-Cristo (1979 miniseries), French TV series starring Jacques Weber. 1984: La Dueña a 1984 Venezuelan telenovela with a female version of Edmond Dantès. 1986: Veta, Telugu film adaptation. Garfield and Friends episode "The Discount of Monte Cristo", a retelling of the story using the characters from U.S. Acres as the cast. Aloysius Pig, voiced by comedian Kevin Meaney, tries to cut the cost of the story, even though the characters are using their imaginations. 2007: The first section of The Simpsons Episode, Revenge Is a Dish Best Served Three Times has an adaption for the Count of Monte Cristo but it is entitled The Count Of Monte Fatso. 2010: Ezel, a Turkey-Turkish television series which is an adaptation of The Count of Monte Cristo. 2011 : Un amore e una vendetta (English: Love and Vendetta) an Italian television series loosely based on the book. 2016: Goodbye Mr. Black, a TV series loosely based on The Count of Monte Cristo"
2016: Once Upon a Time's sixth season features the Count as a character, portrayed by Craig Horner. Several characters and plot elements from the story are also alluded to. 2016: Yago, Mexican telenovela starring Iván Sánchez and Gabriela de la Garza. 2018: The Count of Monte-Cristo: Gorgeous Revenge [ja] (モンテ・クリスト伯 -華麗なる復讐- Monte Kurisuto Haku: Karei Naru Fukushu), Japanese TV series starring Dean Fujioka. 2018: Wes, a Sri Lankan-Sinhala television series which is an adaptation of The Count of Monte Cristo and an influence of Ezel television series. TBA: David S. Goyer will direct a film adaptation of The Count of Monte Cristo. 1884: Edmond Dantès: The Sequel to Alexander Dumas' Celebrated Novel The Count of Monte Cristo, Edmund Flagg (1815–1890). Published in English by T.B.Peterson and Bros. in 1886 (no translator credited). 1884: Monte-Cristo's Daughter sequel to Alexander Dumas' great novel, the "Count of Monte-Cristo," and Conclusion of "Edmond Dantès", Edmund Flagg. Published in English by T.B.Peterson and Bros. in 1886 (no translator credited). 1869: The Countess of Monte Cristo, Jean Charles Du Boys (1836-1873). Published in English by T.B.Peterson and Bros. in 1871 (no translator credited). Alexandre Dumas and Auguste Maquet wrote a set of four plays that collectively told the story of The Count of Monte Cristo: Monte Cristo Part I (1848); Monte Cristo Part II (1848); Le Comte de Morcerf (1851) and Villefort (1851). The first two plays were first performed at Dumas' own Théâtre Historique in February 1848, with the performance spread over two nights, each with a long duration (the first evening ran from 18:00 until 00:00). The play was also unsuccessfully performed at Drury Lane in London later that year where rioting erupted in protest at French companies performing in England. The adaptation differs from the novel in many respects: several characters, such as Luigi Vampa, are excluded; Whereas the novel includes many different plot threads that are brought together at the conclusion, the third and fourth plays deal only with the fate of Mondego and Villefort respectively (Danglars fate is not featured at all); the play is the first to feature Dantès shouting "the world is mine! ", an iconic line that would be used in many future adaptations. Two English adaptations of the novel were published in 1868. The first, by Hailes Lacy, differs only slightly from Dumas' version with the main change being that Fernand Mondego is killed in a duel with the Count rather than committing suicide. Much more radical was the version by Charles Fechter, a notable French-Anglo actor. The play faithfully follows the first part of the novel, omits the Rome section and makes several sweeping changes to the third part, among the most significant being that Albert is actually the son of Dantès. The fates of the three main antagonists are also altered: Villefort, whose fate is dealt with quite early on in the play, kills himself after being foiled by the Count trying to kill Noirtier (Villefort's half brother in this version); Mondego kills himself after being confronted by Mercedes; Danglars is killed by the Count in a duel. The ending sees Dantès and Mercedes reunited and the character of Haydee is not featured at all. The play was first performed at the Adelphi in London in October 1868. The original duration was five hours, resulting in Fechter abridging the play, which, despite negative reviews, had a respectable sixteen-week run. Fechter moved to the United States in 1869 and Monte Cristo was chosen for the inaugural play at the opening of the Globe Theatre, Boston in 1870. 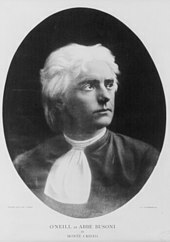 Fechter last performed the role in 1878. In 1883, John Stetson, manager of the Booth Theatre and The Globe Theatre, wanted to revive the play and asked James O'Neill (the father of playwright Eugene O'Neill) to perform the lead role. O'Neill, who had never seen Fechter perform, made the role his own and the play became a commercial, if not an artistic success. O'Neill made several abridgements to the play and eventually bought it from Stetson. A motion picture based on Fechter's play, with O'Neill in the title role, was released in 1913 but was not a huge success. O'Neill died in 1920, two years before a more successful motion picture, produced by Fox and partially based on Fechter's version, was released. O'Neill came to despise the role of Monte Cristo, which he performed more than 6000 times, feeling that his type casting had prevented him from pursuing more artistically rewarding roles. This discontent later became a plot point in Eugene O'Neill's semi-autobiographical play Long Day's Journey Into Night. The Count of Monte Cristo is a musical based on the novel, with influences from the 2002 film adaptation of the book. The music is written by Frank Wildhorn and the lyrics and book are by Jack Murphy. It debuted in Switzerland in 2009. 2012: Iain Glen on BBC Radio 4 adapted by Sebastian Baczkiewicz and directed by Jeremy Mortimer and Sasha Yevtushenko, with Richard Johnson as Faria, Jane Lapotaire as the aged Haydee, Toby Jones as Danglars, Zubin Varla as Fernand, Paul Rhys as Villefort and Josette Simon as Mercedes. 1996: Le Comte de Monte-Cristo (Chinese: 基督山恩仇記; pinyin: Jīdū Shān En Chóu Jì; literally: 'Monte Christo'), an unauthorized Chinese-language Nintendo Famicom game produced by ESC Co. Ltd. (mostly known as Waixing Technology). 2014: Count of Monte-Cristo phone app (in English and Romanian). A puzzle game that comes with a level editor. 2016: In Fate/Grand Order, Edmond Dantès was available for summoning as an Avenger-class servant. Type-Moon also produced an accompanying drama CD about Monte Cristo and various people from his past including Haydée and Abbe Faria. ^ On p. 140 of the Pléiade edition the governor at the Château d'If is promoted to a position at the castle of Ham, which is the castle where Louis Napoleon was imprisoned 1840–46. ^ Thomas Alexandre Dumas was also known as Alexandre Davy de la Pailleterie. ^ "État civil du Comte de Monte-Cristo" is included in the Pléiade edition (Paris, 1981) as an "annexe". ^ a b c d e f Munro, Douglas (1978). Alexandre Dumas Père: a bibliography of works translated into English to 1910. Garland Pub. pp. 91–92. ^ "The Morning Post Front Page". The Morning Post. February 26, 1846. Retrieved 14 January 2015. ^ Dumas, Alexandre (1889). The Count of Monte Cristo. Little Brown and Company. ^ Dumas, Alexandre (1889). The Count of Monte Cristo : or, The Adventures of Edmond Dantès. T.Y Crowell. ^ Dumas, Alexandre (1955). The Count of Monte Cristo with an introduction by Richard Church. Collins. ^ Pierre Milza (2004) Napoléon III. Perrin. ^ "Once Upon a Time books Legend of the Seeker star — exclusive". Entertainment Weekly. 20 July 2016. Retrieved 2 October 2016. ^ "THE COUNT OF MONTE-CRISTO:GREAT REVENGE - FUJI TELEVISION NETWORK, INC". FUJI TELEVISION NETWORK, INC. Retrieved 2018-11-15. ^ "David Goyer to Direct 'Count of Monte Cristo' Remake (Exclusive)". The Hollywood Reporter. 18 March 2013. Retrieved 4 October 2014. ^ "BBC Radio 4 – Classic Serial, The Count of Monte Cristo, Episode 1". BBC. Retrieved 4 October 2014. ^ "Home". The Count Of Monte Cristo. Toesca, Catherine (2002). Les sept Monte-Cristo d'Alexandre Dumas. Paris: Maisonneuve & Larose. ISBN 2-7068-1613-9. 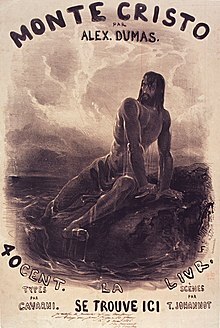 Wikimedia Commons has media related to The Count of Monte Cristo.